Canasta is a card game that can be played with 2 to 6 players, but the ideal number of players is typically 4 as a team game. The rules of Canasta are as follows. Two decks of 54 cards (108 cards total), including the 4 jokers, are used to play Canasta. 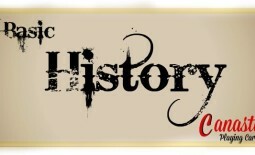 All cards are shuffled together to form one deck. Jokers and Twos (Deuces) are used as wild cards. Threes are bonus cards. In a 4-player game, players are dealt 11 cards to begin play. In variants, players can start out with 13 or 15 cards. The initial shuffle by the dealer is cut and the cards are then dealt face down, clockwise starting with the player to the dealer’s left. The dealer then places the “upcard” on the table to start the discard pile. If a wild card (Joker of Deuce) or a Three appears as the upcard, then one or more cards must be turned over until a normal card appears. Any red Threes that are dealt to any player must be placed on the table and then replaced by an equal number of normal cards. 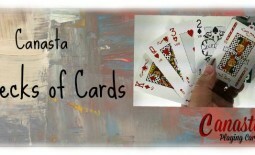 The main objective in Canasta is to score the most points by melding or creating sets out of the cards you have. Making as many canastas as possible is essential. A meld of at least 7 cards of the same rank is a canasta. During a player’s turn, he or she draws one card from the main deck and then discards a card on the discard pile. After a card is drawn, a player can meld cards if he or she wishes. Regular melds must contain 3 cards, but only 3 cards of the same rank. Having 3 Sevens or Eights works. Sequences like Four-Five-Six don’t work. A card that is melded can’t return to a player’s hand. Instead of drawing a card from the main deck, a player can take the entire discard pile, but this is only a legal play if the player can meld the top card. A penalty of 50 points is enforced if you pick up the discard pile but realize that you can’t use the top card. A hand officially ends when one player has no cards left, or when the main deck runs out of cards to draw from. The game ends when a player reaches 5,000 points in his or her total score. A player goes out when he or she has at least one or two canastas. This varies depending on the agreed setting for “canastas needed to go out”. If a player has one card but has fewer canastas than needed to go out, then he or she must “pass the discard”. In other words, not discard the last card. 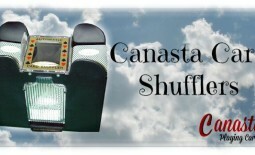 Sponsored by Newt’s Games and Cards – Find canasta decks, card trays, card shufflers and so much more at Newt’s Card Playing World.